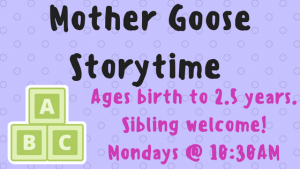 On Mondays children, birth to 2.5 years can join Miss Diana for stories and songs. No need to register, just Drop-in. Siblings welcome. Lower Level Right. 1/7, 1/14, 1/28, 2/4, 2/11, 3/4/19 , 3/11, 3/18, 3/25, 4/1, 4/8, 4/15, 4/22.